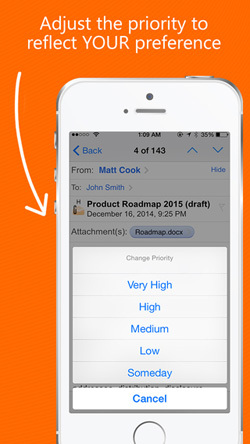 Most of us make do with the standard email system which comes bundled with iOS. It’s streamlined, offers just about all the basic features we expect from an email handler, and ties in perfectly with the iOS design language. 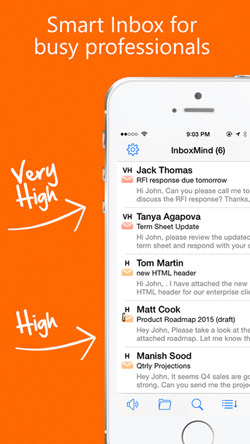 But for those who want to get the most out of email, something like InboxMind could take things to the next level. Email is email is email, you might suggest. And for the most part you would be right – there isn’t a whole lot that an app developer can do to change the inherent functionality of the electronic mail system. The key, then, lies with subtle but ingenious innovations. 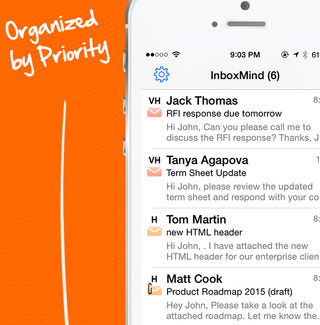 In the case of InboxMind, the package is based primarily on one such innovation – Dynamic Prioritization. 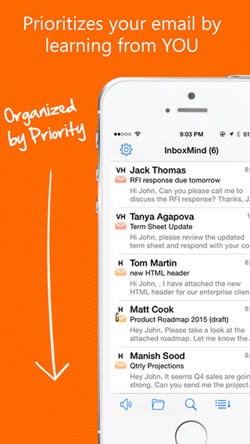 By analysing the usage of your standard mailbox, keeping tabs on your contacts and monitoring your calendar – as well as watching your use of InboxMind itself – InboxMind’s patented Dynamic Prioritization algorithms work perpetually behind the scenes to learn about how you deal with email. This information is then fed into the app and used to automatically determine which of your emails are important to you. It’s all about priorities, see? From the moment you run the app for the first time, InboxMind is tracking your choices – which emails are given immediate attention, which are left to linger unread, which are instantly deleted – and forming a map of your priorities. All of this data then translates into sorting your emails in a way which seems uncannily natural to the user. Emails from the boss may be given highest priority, random chit chat mails between friends are usually slotted in a little further down, while those annoying emails claiming Bill Gates is giving away free money to the first thousand people who reply are tucked away in obscurity where they belong. It’s all very neatly handled, with color-coded tabs for the various levels of importance, and if you don’t agree with the level that InboxMind has allocated a particular mail or sender then it just takes a tap to re-priorotise. And that priority designation alteration is then also instantly remembered for next time. Once a particular email (or multiple-message conversation) has been dealt with, simply tab it as complete, and it’s gone, leaving your inbox tidy and filled only with the mails you need to deal with. Before you spin out in a panic, it’s important to note that InboxMind works alongside your standard mail apps, not in place of them. No matter how you shuffle things around within InboxMind, things remain untouched in your standard mailbox. Think of it as a terribly clever non-destructive mail filter overlay. Never overlook an important email again! The wealth of personalization options means that you can set InboxMind to look out for mails from specific people, or mails including user-specified key words, so that you’ll never miss that one important email among the clutter. 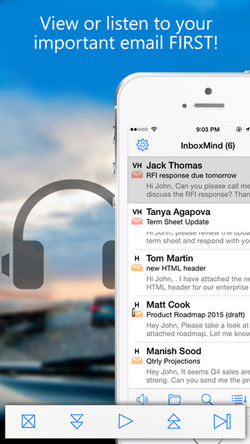 What’s more, should that urgent mail show up while you’ve got your hands full, InboxMind can notify you audibly, reading it out via InboxRadio Smart Alerts. The biggest let-down is that right now InboxMind is limited to Microsoft Office 365, Microsoft Exchange, Outlook.com, Hotmail.com, MSN.com and Live.com providers. But looking at the work that goes on at the back end of this app, it’s hard not to appreciate how clever it all is. And it’s not just empty promises either – InboxMind’s various features really do work together to create an improved email experience. Sceptical? Well, since it’s a free app there’s no excuse to not get hold it and try it for yourself.